The year is 1956 and the Best Picture Oscar goes to Michael Anderson’s Around The World In 80 Days. (Not to be confused with the Disney remake with Jackie Chan) Oh boy, and I thought Marty was hard to get an opinion on, this movie is all over the place. 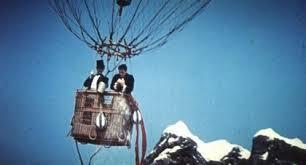 Phileas Fogg (David Niven) makes a wager that he can travel, well, around the world in 80 days, accompanied by his butler. (Cantinflas – I Swear That’s The Actors Name) Along the way, he meets an inspector (Robert Newton), and a princess (Shirley McLaine) who I swear is even blander than Aurora. It would be easy to dislike this film if not for one thing. It. Is. Beautiful. The production design is so detailed and rich, and you feel like you’re there with these characters. I know a lot of it was shot on location, but there had to be some sets for indoor scenes. And the costume design is just wonderful and so varied. The score is also fun to listen to, and a few impressive visual effects are used. It is a wonderful, wonderful film for the eyes and ears. But not so much for the brain and heart. It’s entertaining, sure. But I can’t say i’d really recommend it seeing as how there’s much better films to watch. It’s an enjoyable film, And some sequences, particularly a train scene near the end, are fun. A well made spectacle, just needed better writing and editing.